"Don't tear it, you fool!" a soldier bellowed. "It's no good to anyone in pieces! We'll throw dice for it. Highest number gets the whole thing." The other soldiers nodded and mumbled their assent. Abiram turned away in disgust. Gambling over dying men's clothes! Only a Roman could stoop that low. He strode across the pitted, rocky ground of Golgotha and joined his fellow priests a respectable distance from the three crosses. Abiram recognized Jephthah among the crowd of onlookers. The man stood alone near the rear of the assembly. He had clasped his hands behind his back, obviously entranced by the spectacle. Abiram considered himself lucky to have become friends with a man like Jephthah, a man who had the ear of the high priest himself. "Greetings, Abiram. I didn't expect to see you here." "Greetings, Jephthah. I wouldn't be here, except for an express command from my supervisory priest. I loathe watching men die on Roman crosses. But my superiors seem to think l may gain something from observing this." "I'm sure they just want you to be more aware of the significant events of our time," Jephthah laughed lightly "You spend too much time buried in your books with your pupils. The real world moves on without you. Besides, you know as well as I do that this execution is politically expedient." "Perhaps. But it isn't necessary to enjoy it"' Abiram replied. "Not enjoy it, exactly. Certainly I don't, though l can imagine some who might," he confided. "Still, a very real threat to our authority has finally ended." Jephthah paused, a benign expression on his face. "It really disturbs you, doesn't it?" The young priest nodded and gazed back at the cross where Jesus of Nazareth, the most radical Teacher of the day, hung naked. The sight made him nauseous. Dried blood caked the Man's hands and feet where the soldiers had driven spikes through them. Fresh blood continued to ooze from the wounds. Beneath His crown of thorns, traceries of sweat and blood ran down into His eyes and beard. Occasionally His body would twitch from the agony, but Jesus said nothing. "We shouldn't fight among ourselves like this," Abiram mused softly. "We should be fighting the Romans!" "Careful what you say around here," breathed Jephthah, glancing around nervously. "You wouldn't want anyone to get the idea you support the Nazarene, especially after the high priest reprimanded you for allowing your pupils to discuss His teachings." Jephthah was right. Abiram knew it. He could not afford any more trouble. His superiors had raged at his breach of conduct. They had even assigned a priest to observe his classes to prevent any further "misuse" of time. The observer sat like a vulture in his class, never missing a word. 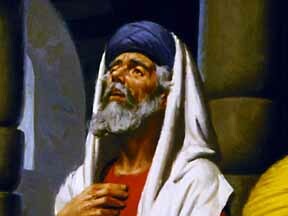 Abiram watched his words carefully. For an ambitious young priest like himself, a wrong word could end his career. Even so, Abiram could not help secretly admiring the Man. He had heard Jesus speak in the Temple courtyard at various times, and the Man's knowledge of the scriptures amazed him. Jesus stymied His opponents from both the conservative and liberal religious factions. Always He had spoken with solid scriptural support, disdaining the tradition the priests held in reverence. Convinced that the Man had the right ideas, Abiram, nevertheless, feared to discard the security of beliefs and traditions he'd grown up with. As for the wild stories of miracles, he couldn't put much faith in them. He'd never seen Jesus perform one. Abiram involved himself too heavily in his teaching duties at the Temple to have witnessed anything like that. Likewise he disbelieved those who insisted that Jesus claimed to be the Son of God. Abiram had never heard Him say exactly that so he doubted that such a thing had ever been said. Besides, the Son of God would never have allowed Himself to be stripped, beaten, and crucified between two thieves. "Did you see Pilate's inscription above the Nazarene's head?" Jephthah asked, breaking into Abiram's reverie. "I hadn't paid any attention to it." "It says 'King of the Jews.' Pilate's idea of a Joke. But then you have to expect that from a Roman. A few of the priests urged him to change it, but he refused. Sometimes he can be stubborn. Still, he did support our decision concerning the execution. Excuse me, won't you? I have to speak to one of the other priests for just a moment. Won't take long." Jephthah moved over to a knot of elder priests. They greeted him warmly before they entered into an animated discussion. Abiram couldn't hear the details, but he admired Jephthah's easy ability to fit in with all types of people. Even his superiors readily accepted him, and that gave Jephthah a certain amount of prestige and power among the younger priests. Abruptly one of the elder priests stepped out of the group, glared up at the dying Teacher; and spat on the ground. Jesus lifted His head and looked at the priest. "You said You could destroy the Temple and build it again in three days! If You're so powerful, save Yourself!" the priest jeered. Abiram barely managed to hide his surprise at the man's outburst. No one, especially a priest, should mock a dying man! Immediately, as if on cue, another priest began to shout. "Come down from the cross if You are the Son of God!" Others joined in until the shouts became confused, and only the hateful venom in their voices could be understood. When Jephthah added his taunt, "He's no king of ours!" Abiram could only stare dumbfounded at his friend. At that moment Jephthah caught sight of Abiram's shocked face, looked down, then turned back to the elder priests. Abiram slipped away into the surly mob that, following the priests' example, joined in the heckling. His mind spun in tight, crazy circles. He thought he'd known Jephthah, understood what kind of man he was, but he must have been wrong. Perhaps Jephthah just pretended to be like them. By working secretly within the system, Jephthah might actually help reform some of its abuses, especially once he had established himself as a leader in the levitical hierarchy But that would be hypocrisy. Or would it? Abiram didn't know. He just didn't know. A new voice rose above the railing mob. Abiram discovered that he had moved quite close to the crosses and that one of the thieves was calling to Jesus. "Aren't You the Christ? Save Yourself and us!" he cried. But before Jesus could speak, the other thief broke in. "Don't you respect even God, since you are under the same sentence? We're getting what we deserve. But this Man has done nothing wrong!" Abiram almost smiled. The thief had said exactly what he would have said had it been safe to do so. The thief's words were a slap in the face of every mocker there. Some of the priests, at least, perceived the importance of those words and grew quiet But the thief's next sentence chilled Abiram to the bone. "Jesus!" begged the second thief. "Remember me when You come into Your kingdom." Jesus raised His head, smiled painfully then assured him, "I promise you today you will be with Me in paradise." At once the crowd began to jeer and howl, drowning out any further words of the Man on the cross. Only then did Abiram notice the darkness creeping in on them. Like some unholy thing, it slithered across the sky, blotting out the light of the sun. It crawled up the valleys and coiled around the hilltops. Thunder pounded in the distance, drawing closer. As the blackness wrapped itself around the crosses, suffocating, crushing, Jesus raised His head and cried out in a voice filled with horrible pain, "Eloi, Eloi, lomo sobachrhoni?" Then His head fell forward as He wept. A wizened old man behind Abiram cackled, "It seems He calls for Elijah. Leave Him alone, and let's see if Elijah comes to save Him." Abiram whirled and pushed his way through the crowd. He couldn't stand it anymore. He had to get out. Run! A hand gripped his arm and stopped him momentarily Jephthah had followed him. "Going, so soon?" Jephthah asked, an odd smile playing across his face. Abiram shivered, for the man's hand on his arm seemed abnormally cold. "I--uh--I have duties at the Temple to prepare for the Sabbath. I have no time for... no time." "I just wanted to explain what you saw a moment ago." "No need..." Abiram began, drawing away slightly. "Oh, but there is. You see, I really have nothing against the Man. Evidently the others do. l was simply showing a polite support of the elder priests' actions. You know, unity among the ranks and all that." "Certainly l can understand that," Abiram said in a tone that indicated Just the opposite. "I don't want you to get the wrong idea of me. Sometimes in order to succeed you have to do things you may not agree with. But friends in high places never hurt anyone. You could stand having a friend or two with connections. Your position is none too secure." Abiram's stomach knotted in fear. "I have to go." For a few seconds Jephthah stared at Abiram, then released him, the spell broken. "Quite right, my friend. Sabbath duties do take precedence." Then with a smile Jephthah added a warning that meant more than its words: "Be careful." Abiram tried to hurry back through the city streets as people scurried about him. The crush of Passover visitors made movement laborious and time-consuming, and the unnatural darkness left him apprehensive. Lightning began to lash out from the black clouds. When Abiram finally entered the Temple courtyard, the evening sacrifice was just about to begin. He stayed to watch as he had done numerous times before. He always felt comfortable, at ease, within the familiar confines of the Temple, though the storm in the sky above caused him some anxiety. The officiating priest stood behind the altar while two servants carried in a lamb and placed it on the altar. Behind the priest and inside the tabernacle hung the curtain that separated the holy place from the Most Holy Place, the most sacred part of the Temple. As the priest lifted the sacrificial knife above his head, he intoned a prayer for forgiveness and blessing. A deep rumbling cut off the prayer. Abiram felt a strange sensation beneath his feet. A pitcher of oil in the corner of the courtyard fell from its perch and smashed to bits on the floor. Its contents oozed across the marble. Masonry cracked and showered down on the priests within the Temple. Tables collapsed, and the altar itself nearly slid from its place. Abiram fell against one of the pillars and clung to it desperately only to discover that it was groaning and twisting. Screams of fear from the worshipers gathered for the Passover celebration mingled with the quaking of the earth. Abiram lost his balance and sprawled onto the floor. He saw the knife in the priest's hand clatter onto the marble floor as the priest fell against the altar and slumped down beside it. The Iamb escaped in the confusion. A white-hot shaft of lightning knifed down the sky and touched a hilltop in the vicinity of Golgotha. The resulting thunder deafened everyone in the Temple and drowned out their cries. Instantly the curtain that had hidden the Most Holy Place from view was ripped from top to bottom. The sacred place lay open to human eyes, stripped of its holiness. Then only the sounds of terrified animals and injured people reverberated through the Temple. The lightning and the earthquake subsided quickly. But on the wind came a strange sound--like a whisper. It spoke three puzzling words.